For many years, the Humans and Orcs waged bloody war, tearing up the earth, felling the trees, and scattering the wildlife. In the end, both sides lay bloody and bruised, with no true victor. While they fought, the Dwarves built their armies. They huddled in their workshops and made war machines and golems. Now is the time for the Dwarves to march for the surface to strike at their weakened foes. As the Dwarves calculated in their caverns, the Warlords of Thain sat high on their island hills. Their shamans communed with the spirits of eagle and wolf, their warriors practised for the coming battles, and their leaders waited for the final word of attack. 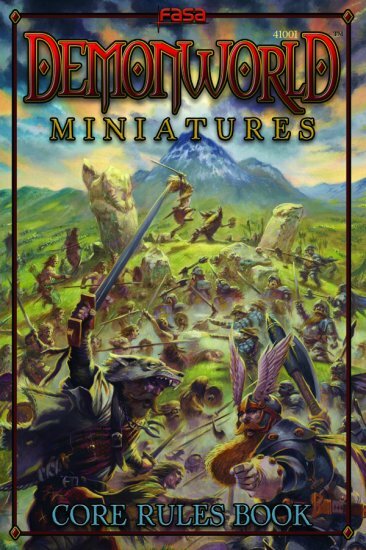 Demonworld is a fantasy wargame in miniature. With easy-to-learn rules, you control units of soldiers, commanders, vehicles, artillery, spirits, giants, and flying creatures. Use powerful magic to defeat your enemy. Locate artifacts lost to time. Defend the honour of your race.